Even as the president tries to cut federal climate initiatives, the states are forging ahead—with Maryland in the lead. In 2014, Maryland citizens join together to stop a proposed expansion of the Cove Point liquid natural gas terminal. Last Monday, Maryland became the first state with natural gas reserves to pass legislation prohibiting fracking. UPDATE: On May 11, after receiving messages from thousands of supportive Marylanders (including hundreds of Earthjustice supporters), the Maryland Public Service Commission approved a pair of large scale offshore wind developments, in what will be the largest project of its kind in the nation. Last Monday, on the eve of President Trump’s sweeping executive order aimed at unraveling federal actions on climate change, cries of joy echoed in the chambers of Maryland’s statehouse, within earshot of the White House. Maryland's victory demonstrates how communities can carry climate action forward. 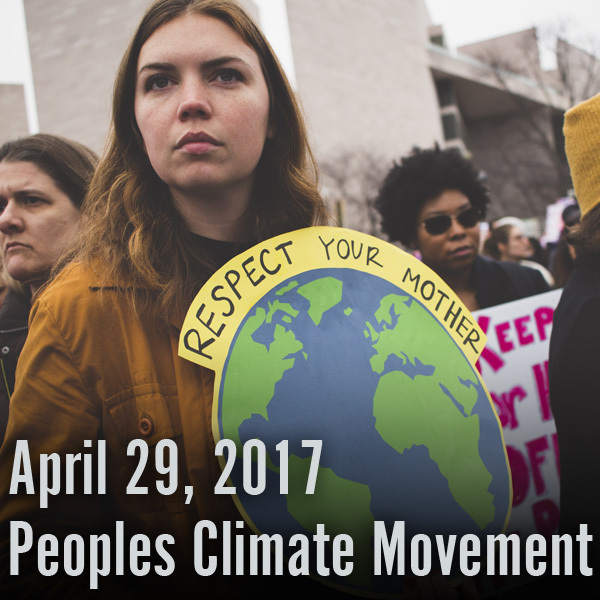 At the Peoples Climate March this April, let's take back our right to clean air, clean water and a healthy environment. That night, Maryland legislators gave final approval to a bill banning fracking within the state’s borders, making Maryland the first state with natural gas reserves to pass legislation prohibiting this dangerous drilling practice. Maryland’s victory to keep gas in the ground is yet another example of how states and local communities can and will carry climate action forward—no matter how hard President Trump tries to drag us backward. In fact, Maryland is making strides against climate change right now in five big ways, including by banning fracking. Earthjustice played an important supporting role in this effort. 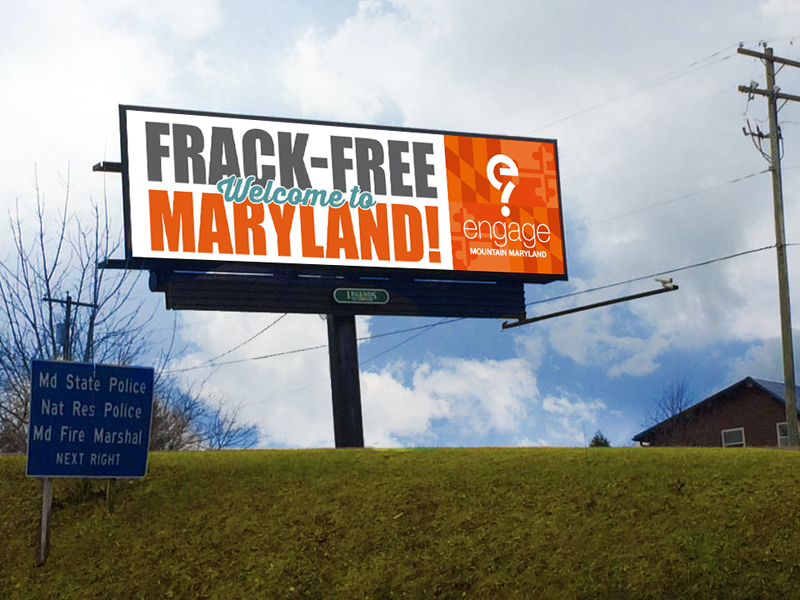 Representing Engage Mountain Maryland, a grassroots group in Western Maryland, we built the case that Maryland’s existing proposal to regulate fracking was insufficient to protect public health, the environment and local economies. Maryland will now remain frack-free forever, joining New York and Vermont in banning this toxic practice. A new billboard welcomes visitors as they enter McHenry, Md. The day after Maryland legislators said “no” to fracking, they said “yes” to greater energy efficiency. The state’s General Assembly passed legislation that, if signed by Governor Hogan, will enshrine into law the strong energy savings targets for utility companies that the Maryland Public Service Commission first adopted in 2015. Earthjustice and our partners helped secure those prior regulations and pushed for this bill because the benefits of energy efficiency for consumers and the climate are enormous. Maryland’s existing efficiency program, called EmPOWER Maryland, is helping residents save $4 billion on their electric bills while eliminating the need for the equivalent of four dirty power plants. The new legislation will ensure continued progress in the state, regardless of any changes to the public service commission and even as the Trump administration threatens to go after popular programs like Energy Star at the federal level. Maryland is about to officially launch an innovative community solar pilot program; regulators will begin accepting applications for the first wave of solar projects this April. In 2015, Earthjustice was instrumental in passing the bipartisan state legislation that began this three-year pilot, which will expand access to affordable solar power. Under the program, multiple people, including renters, will be able to invest in or subscribe to a single solar energy project, and in turn, offset a portion of their electric bills. Importantly, 30 percent of the program’s capacity is set aside for projects serving low- and moderate-income households, ensuring that communities of all income levels will have the opportunity to reap the benefits of cleaner power. 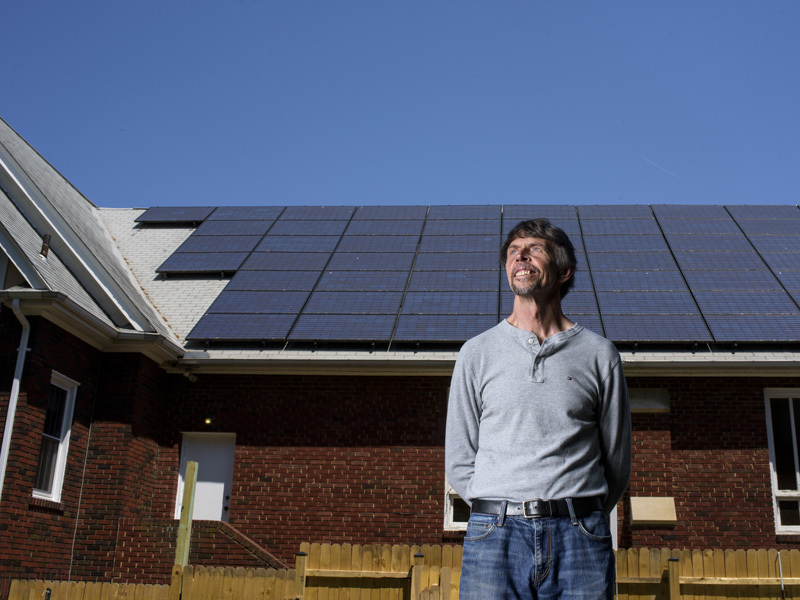 David Brosch stands in front of a 22-kilowatt solar electric array atop the roof of the University Park Church of the Brethren in Maryland. The solar panels on top of the church produce an estimated 25 percent more energy than the church needs per year. 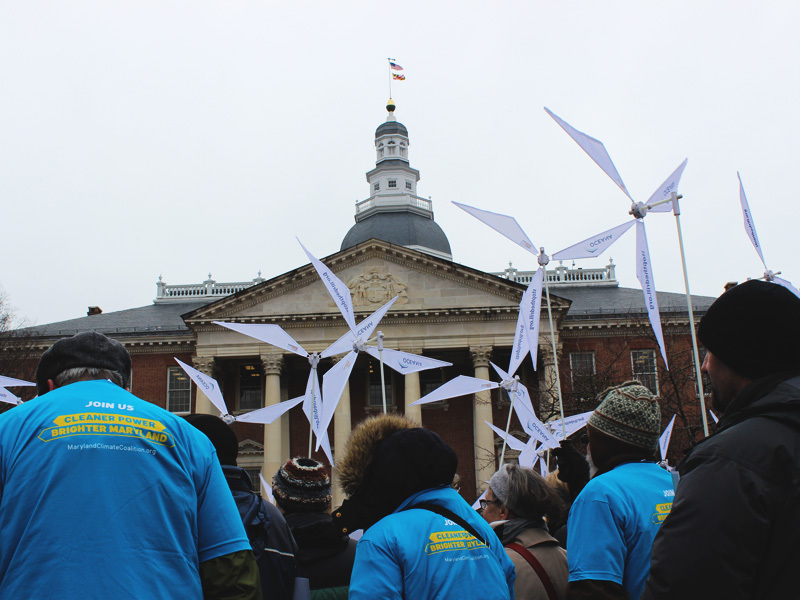 Back in 2013, Maryland climate activists got lawmakers to pass legislation establishing the building blocks of offshore wind power in the state. This spring, Maryland regulators will decide whether to approve the state’s first offshore wind farm, which would be the biggest on the East Coast. Earthjustice is representing the Maryland Sierra Club and the Maryland League of Conservation Voters in the proceeding. If regulators say “yes,” steel turbines could soon be spinning miles off the coast of Ocean City, harnessing a huge, untapped source of renewable energy and providing a shining example of bold climate action within a day’s drive of the White House. 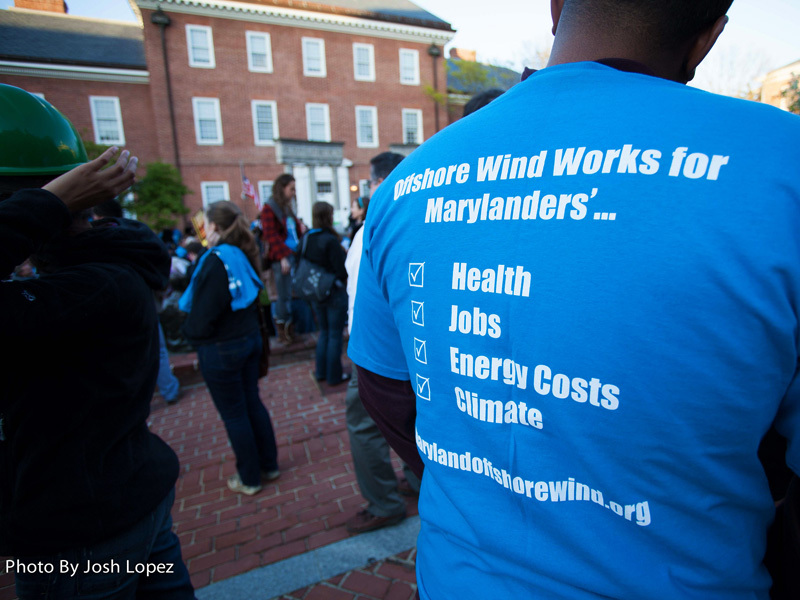 Clean energy advocates gather at an offshore wind rally at the Maryland Statehouse on April 2, 2012. In early February, Maryland legislators voted overwhelmingly to increase the state’s renewable energy standard. The bill, approved over Governor Hogan’s veto, requires utilities to get 25 percent of their power from clean energy sources by 2020, up from the current goal of 20 percent by 2022. This law will help accelerate not only Maryland’s reliance on solar and wind power, but also the number of jobs that comes with it. The solar industry now employs more people than either the gas or coal industries; solar created 1 in every 50 new U.S. jobs in 2016. There are two clear takeaways we can draw from Maryland’s shining example. First, none of this progress has come easy or evenly. It’s a reflection of years of people-powered organizing supported by strategic lobbying and legal intervention involving a broad range of people and organizations. And second, clean energy progress under the Trump administration is entirely possible—and likely unstoppable—if we keep building power this way at the local and state levels. That’s why we hope you’ll join Earthjustice in President Trump’s front yard on April 29th for the Peoples Climate March. We’ll march together through the streets of D.C. for the climate, jobs and justice. We’ll build stronger connections within the climate movement and take that energy back to our home states and communities, where we can and will keep forging ahead.